I was going about my daily cleaning routine and got to thinking about how much I love the line of cleaning products I have been using. I have been in the process of greening the Elsmo Four for a while now...reusable grocery bags, recycled paper products, and lights are turned off as much as possible. Just some small steps that over time will hopefully make a big difference! J.R. Watkins is an established all natural apothecary and recently unveiled their new line of all-natural plant based products that are safe for the environment and my family. 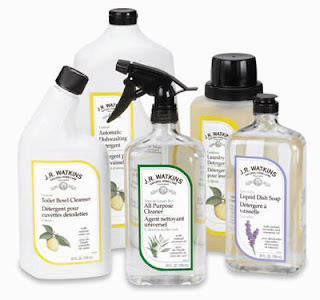 My glass cleaner contains lavender and rosemary and smells divine and our hand soap is made with green tea and aloe. I have to admit, the products are pretty expensive. For that reason I steer clear of the JR Watkins toilet bowl cleaner; using feels like literally flushing money down the toilet!